LegalMatch is an online attorney-client matching service that was established in 1999. While they are based in California, their offices are located in Texas and Nevada as well. They offer solutions to any client needing legal services in the entire United States. While early controversy made it unclear if using LegalMatch to find a lawyer was legal, it has been made clear, especially throughout the early 2000s, that LegalMatch is approved by most state bars, as well as the FTC. Through their matching service, clients needing legal advice or representation are put in touch with local attorneys who are experts in the specific field of law that the client needs help with. For individuals looking for a lawyer, especially in the areas of bankruptcy, personal injury, family law, real estate, and criminal defense, LegalMatch is a pretty straightforward, no-strings-attached service. There is a quick process to go through to help you decide which area of law fits your needs (there are a dozen different areas of law that LegalMatch can help with). After this step, LegalMatch will seek out lawyers in your area with the experience you need, and they will contact those lawyers to do a prescreening step on your behalf. Lawyers are not told your name at this point, but they are given information about your case; you are then sent a message with information about any lawyer interested in helping with your case, including their experience level and pricing. At that point, it’s very easy for you to contact the lawyer you wish to work with. For consumers, all of this is totally free, with no fees of any kind for clients. Additionally, their website is full of helpful articles and information about the legal process for many of these areas. If you have no idea where to start with the legal system, LegalMatch offers a ton of tips and FAQs that can help prevent the situation from becoming overwhelming. For lawyers, LegalMatch isn’t quite as positive. While user reviews from clients are unanimously great, lawyers frequently report that they are paying for a service that never leads to any clients. 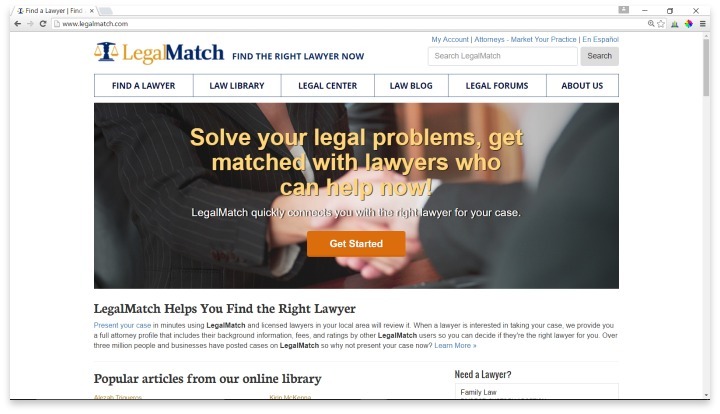 Additionally, LegalMatch’s method of selling their services to lawyers has come under fire; rather than offering their matching services in a clear manner, LegalMatch has in the past called unaffiliated lawyers, claiming to have a client in need in the area; after this initial lead is shared, only then does LegalMatch share the fact that they are a subscription service that requires attorneys to pay for their leads. LegalMatch has issued public apologies when called out on various legal blogs, but it is unclear if they have ceased these practices. LegalMatch is an online attorney-client matching service that offers solutions to any client needing legal services in the entire United States. If you are a client in need of legal help, and you want to save time searching for your own lawyer, LegalMatch is a great place to start. You aren’t obligated to hire any of the lawyers they present; even if you don’t end up finding a good match, going through LegalMatch’s easy case presentation process can help you discover exactly what it is you need when you begin your own search. For lawyers, LegalMatch may be a cautious investment to consider. You may find that they send you plenty of leads; but if you, like so many others, find that contact dries up after the first lead, LegalMatch may be an idea better left behind. Have you had an experience with this company? Please share your LegalMatch reviews below.